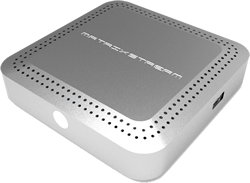 MatrixStream Set Top Box GUI - MatrixStream Technologies, Inc.
Below are some examples of MatrixStream set top box user GUI. The entire GUI is completely customizable. The set top box GUI is designed to give viewers the ultimate IPTV experience. It is designed to allow viewers to easily navigate the menus. Users can select live TV viewing, VOD viewing, and run applications. Additionally, developers can develop add-on applications on top of the GUI using MatrixStream’s MediaMatrix API.